The 30"H Lab Stool w/Square Hardboard Seat and Backrest-6330B meets all ANSI/BIFMA standards. 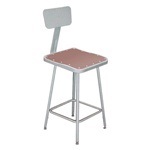 It features a sturdy steel frame and fiberboard top to stand up to daily use. An 18ga steel tubing footring is welded to each leg.